TL;DR - Azure API Management released a new version that changes the OpenAPI interpretation. This article dives into the potential impact on of the consumer experience of your APIs. Update I (23-05-2018) - The Azure API Management team released a new version of the PowerShell cmdlet which now supports this new OpenAPI interpretation. Update II (09-11-2018) - SwaggerOperation is now available in the Swashbuckle.AspNetCore.Annotations NuGet package instead of Swashbuckle.AspNetCore. Providing clean and well-documented APIs is a must. This allows your consumers to know what capabilities you provide, what they are for and what to expect. This is where the OpenAPI specification, aka Swagger, comes in and defines how APIs should be defined across the industry, regardless of what technology is underneath it. Recently, the Azure API Management team started releasing a new version of the product with some new features and some important changes in how they interpret the OpenAPI specification while importing/exporting them. Before we dive into the changes to OpenAPI interpretation. I'd like to highlight that they've also added the capability to the display id of a specific operation. In the past, you still had to use the old Publisher portal for this but now you can find it via API > Operation > Frontend. Next to that, as of last Sunday, the old Publisher portal should be fully gone now, except for the analytics part. The latest version also changes the way OpenAPI specifications are being interpreted and are now fully based on operation as defined by the OpenAPI spec. I like this change because it makes sense, however, this can be a breaking change in your API documentation depending on how you achieved it in the past. For all the projects I work on I use Swashbuckle because it's very easy to setup, use and ties into the standard XML documentation. Here is an example of the documentation I provide for my health endpoint for Sello, which I use for demos. As you notice, everything is right there and via the operation I specify what the operation is called and give a brief summary of what it does and what my consumers can expect as responses. "description": "API is up & running"
"description": "API is not available"
Aligning with the latest interpretation was fairly easy to be honest, instead of providing a description what the operation does via summary I started using remarks instead. Next to that, I'm now using summary to give the operation a friendly name and assigned a better operationId via SwaggerOperation. 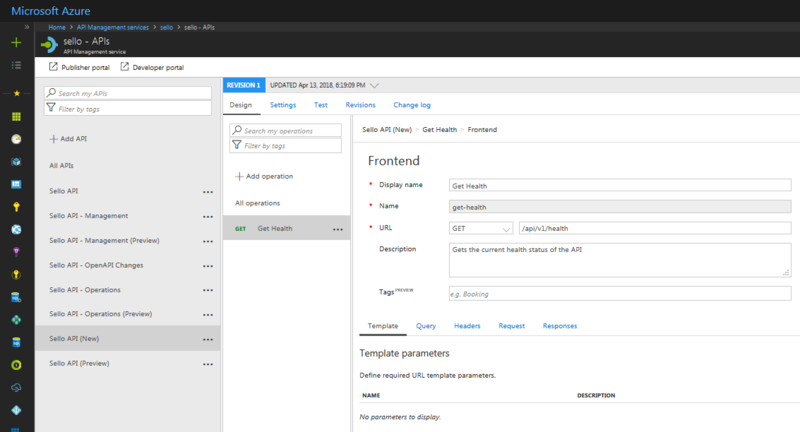 Azure API Management rolled out a change to the OpenAPI interpretation to provide more flexibility so you can define the operation id to use and align with the general specification. This change is great, but it might have an impact on your current API documentation, similar to what I've experienced. With the above changes, you are good to go and your consumers will not even notice it.